Having an area of about 438000 square kilometers, the Sea is the largest lake in the world, wich goes to Black Sea and Baltic Sea through Volga and Volgadon rivers and connects northern ports of the Caspian Sea to northern and southern European ports.The depth of this sea increases southward, so that the depth of northern areas do not exceed 16 meters and reaches a depth of 1000 meters in south and south-western parts. Eighty percent of entering water of the Caspian Sea ia supplied by Volga river. The length of the Caspian Sea is about 1205 kilometers and its average width is 554 kilometers. 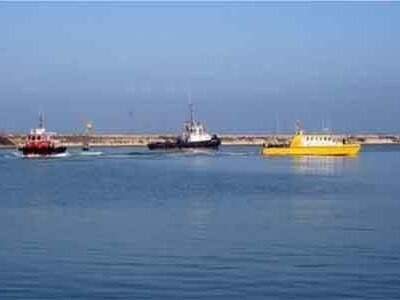 The difference of water level at the Caspian Sea compared with open seas has been registered at -26.2 meters at Nowshahr port. The most important utilization of the Caspian Sea are shipping, business, oil, passenger and fishing exchanges. The shores of this sea are mainly sandy and plain low. The presence of the Caspian Sea has a determining role in the weather and climate of the northern beaches of Iran and all the unique beauties of Guilan, Mazandaran and Golestan provinces depend upon the availability of environmental conditions of this Sea. The length of Iran's coast beside this sea extends from Hosseingholi Bay to the central city of Astra and includes Guilan and Mazandaran and a part of Golestan provinces. The most important active ports of the Caspian Sea are "Anzali" and "Nowshahr" at Iranian coasts, "Bako" at Azarbaijan coasts, "Makhach Ghaleh" and "Astrakhan" at Russia coasts, "Aktao" at Kirghizia coasts and "Turkmenbashi" or "Krasnavodosh" at Turkmenistan coasts. Following the independence of republics beside the Caspian Sea, the political and economic situation of the Caspian Sea changed and Iran, as the shortest connecting route of these countries to open seas and located at the route of Corridor 9, found a significant importance. Compare with the route of the Persian Gulf, transportation of goods through poprts of the Caspian Sea to Europe is more suitable and economical due to favorable climate, cheap transportation fare and shortness of the route. Nowshahr City connected to the Caspian Sea at north, the Alborz Mountain chain, to Noor City in east and Chalous City in West. The building of Nowshahr port started in 1309(1930-31) By Burworks Company of the Netherlands and Agerman Company of Belgium and was established in 1318(1939-40). The parts and machinery of Karaj Steel plant was the first consignment which was loaded on a commercial ship with a capacity of 1000 tons from Russia and unloaded at Nowshahr port in 1318(1939-40). At least 500 ships travel at this port each year. 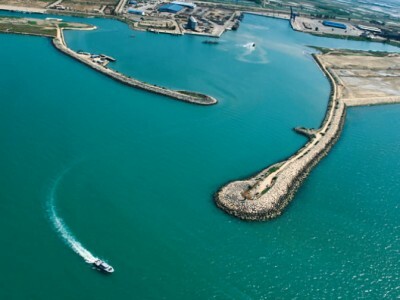 Having geographical specifications of 51 degree and 36 minutes eastern longitude and 39 degree and 30 minutes northern latitude, Nowshahr port is one of the commercial ports of Mazandaran province which has been changed into one of the major economic center for exchanging goods from the Islamic Republic of IRAN to the countries beside the Caspian Sea. Among significant importance of this port is that, it is the closest port to the center of the country(Tehran) compared with other ports, which is connected to the center of the country and other points, particulary Guilan province in west and Golestan province in east via asphalt and air lines. The minimum and maximum temperature during the year are 7 to 63 degree centigrade, respectively and the amount of is moisture is between 75 to 85 percent. The distance between Nowshahr to Tehran is 200 kilometers, which is decreased to 120 kilometers by constructing Tehran-North freeway. 1. 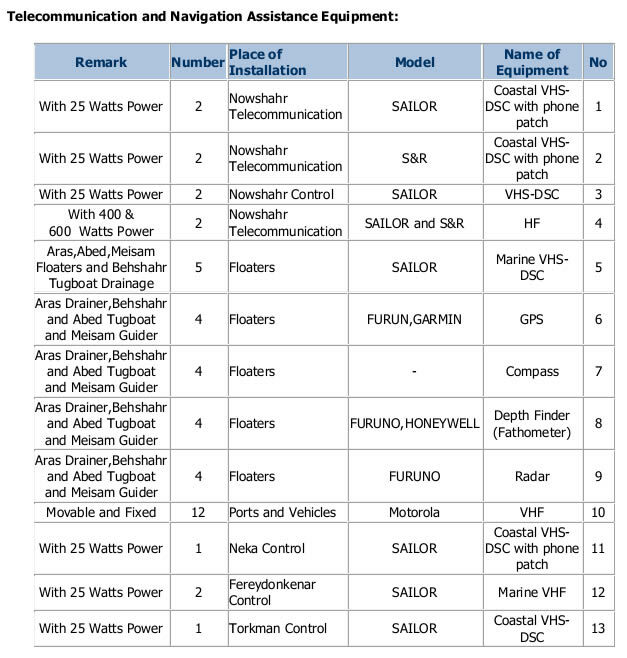 Closest port to important industrial and production centers and populated cities of the country like Tehran, Central, Semnan and Khorasan provinces. 2. Having suitable climatic conditions in goods transit and export, particulary fruits, vegetables, dried fruits to Middle Asia and Caucasian countries. 4. Shortness of marine route to European and Middle Asian countries with a 1/3 distance and time. 5. Availability of 7 standard roofed warehouses with an approximate area of 30000 square meters. 6. Utilizing advanced and high technology telecommunication, loading and unloading equipment. 7. Availability of passenger terminals for passengers traffic from Nowshahr port to the Caspian Sea border countries. 8. 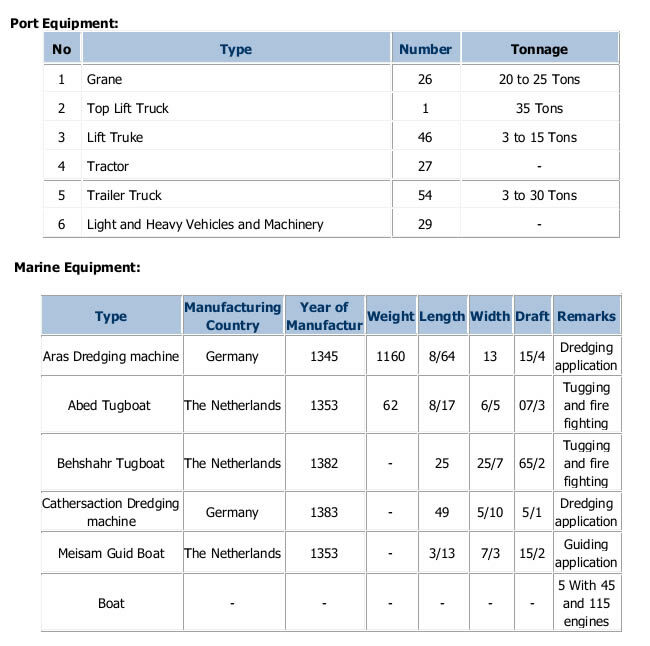 Capability for receiving ships special for shipping loaded wagons and trucks in order to shorten goods transportation routes and also offering facilities for combined transportation, preventing goods wastes and foreign exchange savings. 9. Allocating roofed warehouse and yard for exporting goods. 10. The most beatiful the Caspian Sea border port due to having significant tourist attractions with suitable geographical position and matchless spectacles. Major imported goods include: chemicals, minerals, ironworks, constructional materials, spare parts, oil materials, nonferrous metals, metallic products, paper and cardboard, wood and board, filled container, empty container, rubber and plastic, cloth and fibres, obsolete goods, etc. Major exported goods include: Fresh fruits and vegetables, dried fruits, veterinary and plant products, minerals, nonferrous metals, grocery goods,filled container, empty container, etc.